‘Live! Wife Carrying! With Kelly & Michael’ next year? The annual wife-carrying contest at the Sunday River ski area in Maine may have a couple of celebrity contestants next year. 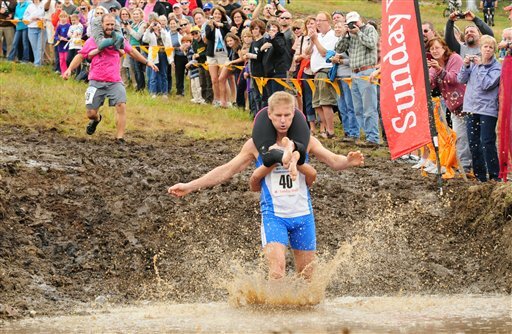 The annual wife-carrying contest at the Sunday River ski area may have a couple of celebrity contestants next year. “Live! With Kelly & Michael” aired a video clip Monday morning from the 2012 North American Wife Carrying Championship, held Saturday at the resort in Newry. Co-host Kelly Ripa noted that couples don’t have to be married to compete in the mud-and-log obstacle course and suggested that she and co-host Michael Strahan should enter next year. Taisto Miettinen and Kristiina Haapanen of Helsinki, Finland, won Saturday’s race, completing the course in just under 53 seconds. The couple are world champions of the arcane sport that started in their homeland. They edged out second-place finishers Jesse Wall and Christine Arsenault of Maine by a little more than a second.